Osteoarthritis (OA), also commonly known as degenerative joint disease (DJD), is the most common form of arthritis. It is a progressive, non-inflammatory disease characterized by changes in the structure and function of the joint cartilage, adjacent bone, joint capsule, and other surrounding tissues. Watch the osteoarthritis video. The most commonly affected areas are the neck and low back, hips, knees, ends of the collar bones, wrists, and last knuckles of the fingers; however, any joint can be affected. 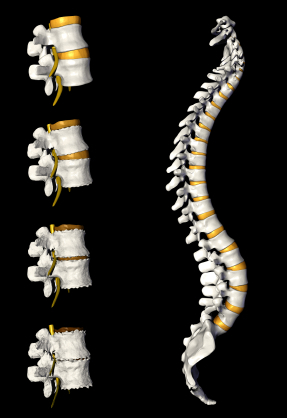 In the spine it is usually accompanied by degenerative disc disease (DDD). It is estimated that 90% of all people will have some degree of OA in their weight-bearing joints by age 40, although relatively few have symptoms. There are two types of osteoarthritis: primary and secondary. In primary OA the initiating factor is unknown and it is more common it the weight-bearing joints of women in their 50’s and 60’s. In secondary OA, the factor or event is known, for example, repetitive movements, recurring injuries, abnormal joint movements, or even prolonged immobility. Any joint can be involved, and it effects men and women equally, usually in their 20’s to 60’s. It is important to note that the pain can also be referred to some other area of the body, for example, the buttock and thigh in the case of uncomplicated low back osteoarthritis. When OA strikes the spine it can effect the intervertebral discs and the posterior spinal joints, leading to spinal cord and nerve root syndromes which can cause weakness, pain, and other abnormal sensations in the arms and legs. In severe cases these syndromes can also cause improper functioning of some internal organs such as the bladder. Osteoarthritis is diagnosed by its signs and symptoms and by x-rays. 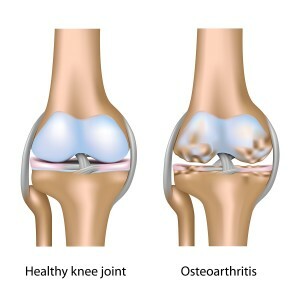 Other tests such as blood and joint fluid analysis may be performed to distinguish OA from other types of arthritis. In mild to moderate cases it can be treated effectively by “conservative” means, that is, without drugs or surgical intervention. There are four major treatment approaches for OA: physical management, lifestyle management, medication, and surgery. Viscosupplementation, is also a limited option. Education about the problem is the first important step. Active patient involvement is the second. Chiropractors, physical therapists, and occupational therapists teach techniques to the pain and restore joint motion and muscle strength to increase comfort throughout daily life. Joint manipulation, mobilization, and traction performed are all effective therapies for treating OA when appropriately applied. Exercise helps lessen symptoms of OA and make the patient feel better overall. Appropriate and moderate stretching and strengthening helps relieve pain and keeps the muscles and tendons around the affected joint flexible and strong. Low impact exercises like swimming, walking, water aerobics, and stationary bicycling can all reduce pain while maintaining strength, flexibility, and cardiovascular function. Patients should always check with their health care provider before beginning an exercise program. Patient must protect their joints by avoiding excess stress from daily tasks. For example, alternate heavy tasks with lighter ones, avoiding stressful joint positions and support them where necessary, using assistive devices such as canes and grab bars. Patients must strive to stay at their recommended weight to avoid increased stress on their joints. Research has shown that, for women, losing as little as 11 pounds in middle age can help prevent OA in the knees. Even if you already have OA, losing weight can help reduce stress on your joints. Topical capsaicin creams have also been proven effective in treating OA. General painkillers: During the non-inflammatory phases of OA non-prescription drugs as acetaminophen (Tylenol, Panadol), ASA (Aspirin, Anacin), and ibuprofen (Motrin IB, Advil) can provide temporary pain relief. Non-steroidal anti-inflammatories (NSAIDs): For the inflammatory phases of OA nonsteroidal anti-inflammatory drugs or NSAIDs (Aspirin, Voltaren, Naprosyn, Motrin, Relafen, and many more) can provide long-term relief from chronic pain and inflammation. However, they are not without risk. Long-term NSAID use can cause intestinal bleeding (especially among the elderly). To counter this misoprostol (Cytotec) may be used. Long-term NSAID use may also cause joint damage. COX-2 selective inhibitor NSAIDs directly target COX-2, an enzyme responsible for inflammation and pain. They reduce the risk of peptic ulceration, the main feature of drugs such as celecoxib (Celebrex). However, this class of NSAID can pose a risk to other organs. Corticosteroids: For severe pain and inflammation, corticosteroids may be injected into the joint. Corticosteroids are man-made drugs that closely resemble cortisone, a hormone natural produced by the body. This treatment is used cautiously because corticosteroids can weaken the cartilage and demineralize (and weaken) the bone, resulting in further joint weakness. If all conservative therapy has failed, surgical measures such as joint replacement (where possible) and spinal surgery to decompress the spinal cord or nerve roots can be very effective. During viscosupplementation a clear gel-like substance is injected into the knee that helps the joint fluid regain its viscoelasticity, that is, its ability to lubricate joint cartilage and absorb mechanical shock. Viscosupplementation restores frictionless movement within the joint, thereby reducing pain and allowing greater mobility. Although there is no cure for OA today, much can be done to help people with the condition. Benefits of treatment include less pain, less stiffness, and easier movement. A patient’s active involvement in their prescribed treatment plan is absolutely essential.